Whether you’d like to lose a few pounds in traditional areas — your waist, thighs and bottom — or finely sculpt your arms, neck or chest, VASER Lipo gives you the results you want. Watch an animated presentation that details the VASER Lipo procedure. You’ll learn how it works and see actual before and after results. VASER® Lipo uses a minimally invasive technique called LipoSelection® to selectively break apart and gently remove unwanted fat. After the surgery, patients are prescribed a recovery regimen to promote maximum skin retraction and smooth results. Your physician may recommend massage therapy to enhance results and speed recovery. Answers to the most frequently asked questions concerning VASER Lipo treatments. Q. 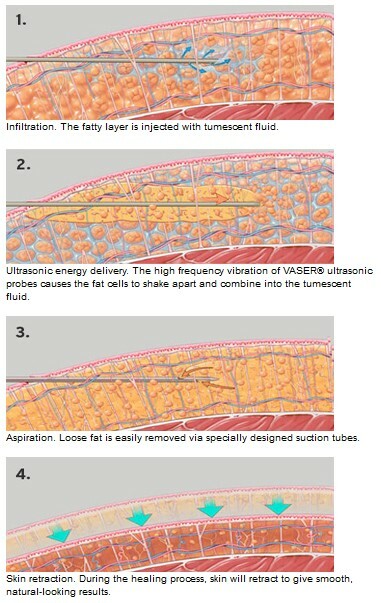 What is VASER Lipo®? How does it differ from traditional liposuction? A. VASER Lipo is an advanced body contouring procedure that selectively removes unwanted body fat. An alternative to the harsh techniques of traditional liposuction, VASER Lipo uses state-of-the-art ultrasound technology designed to gently reshape your body. What distinguishes the VASER Lipo procedure is its ability to differentiate fat from other important tissues — such as nerves, blood vessels and connective tissue. Our innovative technology breaks up fat while preserving all other important tissues. This approach promotes smooth results and rapid healing. A. First, the area to be reshaped is filled with a tumescent saline solution that helps numb the site and shrink the blood vessels (to minimize blood loss and reduce bruising). This solution wets and fills the area to be treated, making it easier to break up fatty tissue with the VASER Lipo System’s ultrasound energy. A. VASER Lipo allows physicians to treat multiple body areas at one time. A doctor will be able to give you a better idea of what is right for you and how much fat will be taken out during your procedure. Bear in mind that this procedure is not intended as a weight loss solution. The goal is to create a slimmer silhouette. You may not notice a significant amount of weight loss, but you should be pleased with your slimmer new shape. Q. Where is VASER Lipo performed? 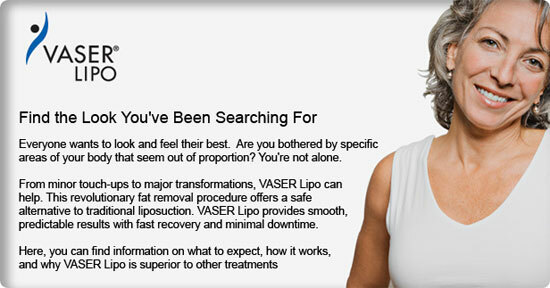 A. VASER Lipo is performed in a clean or sterile environment. Some possible options are in a doctor’s office, an outpatient surgery center or a hospital. The procedure can be performed under local anesthesia (awake), IV sedation or general anesthesia. You and your physician will decide the best type of treatment for you. A. This varies with the extensiveness of the procedure: the amount of fat removed, the number of areas treated and so on. Many patients report that they see results immediately after the procedure with the final result around three to four months. Your doctor can help you establish realistic expectations. Q. What about future weight gain or fat migrating to other areas? A. This is a common misconception. If you experience weight gain or loss after your VASER Lipo procedure, it will tend to be proportionately distributed over your entire body. A. If you are frustrated by the resistance of certain body areas to diet and exercise, VASER Lipo may be the solution. If you are healthy and seeking a fast, low-pain way to lose stubborn fat deposits, the VASER Lipo procedure could be your answer. A. VASER Lipo is an advanced procedure, and it is impossible to provide an accurate estimate for your procedure without an in-person consultation with a VASER® physician. The total cost of your treatment will vary depending upon the number of body areas treated and the extensiveness of the procedure.